My daughter wants to have a "fun" reception. She and her fiancé want to have a "Fair" theme. She wants it in our backyard (it’s big) and have a hot dog cart, a cotton candy cart, popcorn etc. Then for desert have maybe an ice cream cart, chocolate fountain, etc. She would like to have the décor kind of like "Farrels Ice Cream Parlor" with the vendors dressed in black, red and white. She wants it lovely, but fun. Any ideas? Have a tent in the backyard, and think of it as a Big Top. Hire entertainment like a fire eater/breather, magician, and a fun band. In addition to cake and ice cream, consider serving small, novelty deserts like miniature pies, tarts and assorted baked goods. Have cigarette girls, dressed in costume, hand out candy or cigars if you have a smoking crowd. Get creative and build or rent carnival games like a dunk tank, ring toss and other games. For favors, rent a photo booth (the kind found on the boardwalk or at the mall). Your guests can keep a few of the photos, and then they can put a few in an album with a special written note to you. 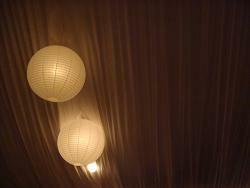 For lighting hang colorful lanterns throughout the tent and reception space. It is definitely possible to have a classy, fun carnival wedding event, so don’t be afraid to be creative.